Hampton Sun's Hydrating Aloe Mist is the perfect way to replenish moisture and soothe skin with an invigorating, refreshing spray. Natural aloe and cooling menthol give skin a boost after a day in the sun, after stepping out of the shower, or any time skin needs an added touch of luxury. Water based formula is oil-free and fragrance-free, allowing you to reap the benefits of moisturizing aloe without any sticky residue left behind on skin. Simply spritz on your skin for an instant opulent experience. Powerful Aloe and antioxidant Vitamin E work with menthol to send moisture deep into the skin and calm its surface. 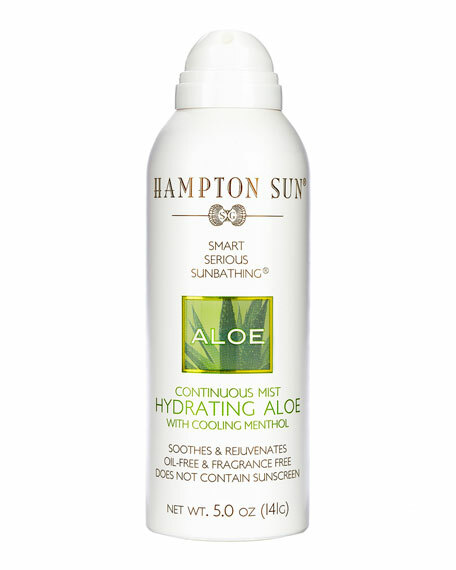 Hampton Sun's Hydrating Aloe Continuous Mist with Menthol naturally cools, heals, and rejuvenates skin after time spent in the sun's rays or to quench skin's thirst any time your body could use a natural pick-me-up! An alcohol-free, multivitamin face mist that delivers a refreshing surge of essential antioxidant protection and an instant, dewy glow. Win-win!